Let's take a walk, you know how you prepare a drink for someone, any drink, a glass of juice, kool-aid, water, soda, an adult beverage, etc and you figure I might as well top it off, which translates into giving them a little more than they have now, that will help them quench the thirst that they long to fulfill, well that is what the tops that are pictured here will do for your wardrobe as well, top it off! The selected tops should fulfill your Fall/Winter 2012-2013 wardrobe top quest. They will add pizazz, variety and purpose to the things that you are wearing already. Often times fashionistas just need a few new pieces to pair with their favorite pieces to have a whole new look or perspective on fashion as the seasons and moods change. So I hope that these selected tops will lead you in the right direction of tops for your particular style. And if not, you can always contact Notable Styles and More directly with your style questions. 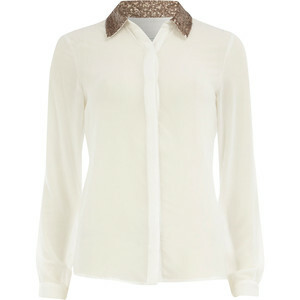 You can pair this blouse with skinny jeans or tuxedo pants with a sequin side seam or a flare out lightweight fabric skirt for a wintery, romantic look. For the winter pair with a muted gray or rich purple bottom to be the light at the end of anyone's tunnel. Pair this with slacks or leather/faux leather fitted bottoms for a knock out look. 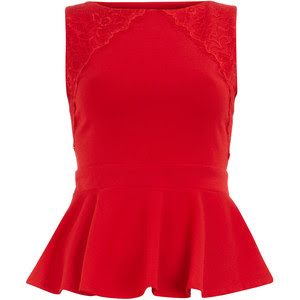 This can go with black denim, metallic/wet look pants and even fitted skirts. This light minty color can be paired with just about anything. 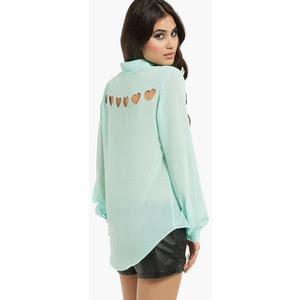 Don't forget to accent the subtle details by showing off the hearts in the back.